(Phys.org) —California brown pelicans' breeding numbers are in drastic decline this year, according to an annual population survey led by a University of California, Davis, professor emeritus. The low nesting rates this spring could indicate that an El Niño event could occur sooner than expected, or that other factors are imperiling the once-endangered species. 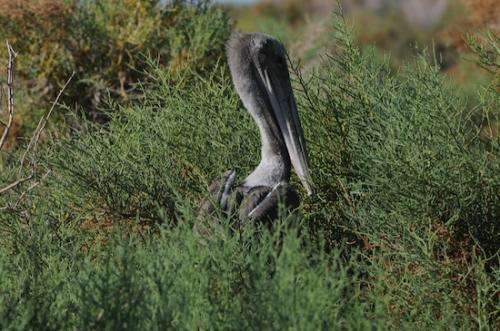 The search for food—mostly anchovies, sardines, and other small, schooling fishes—resulted in thousands of brown pelicans flocking to food hot spots along the southern California coast and as far north as Washington this May, about six weeks earlier than expected. Large numbers are also being observed migrating across the Baja Peninsula roughly six weeks early. California brown pelicans were delisted from the Endangered Species list in 2009. Roughly 90 percent of them typically breed and rear their young off the coasts of western Mexico, with the remainder breeding in the Channel Islands in Southern California. 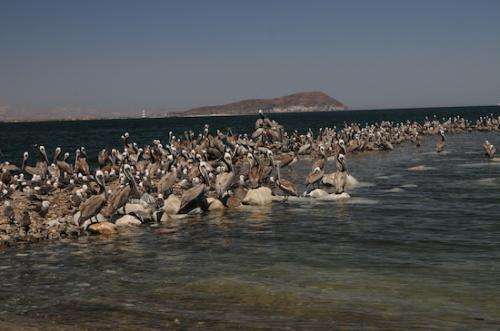 The survey, completed in late May, of breeding colonies in Mexico's Gulf of California, was conducted by UC Davis professor emeritus and wildlife biologist Dan Anderson with colleagues from the Mexican conservation agency National Commission of Natural Protected Areas (CONANP). The scientists found that this year, areas that typically host hundreds or thousands of nesting pairs held only a few hundred at most, and in some cases zero nesting pairs. "That's what we call a failure, a bust," said Anderson, who has been monitoring brown pelicans for the past 46 years. "The bottom dropped out." 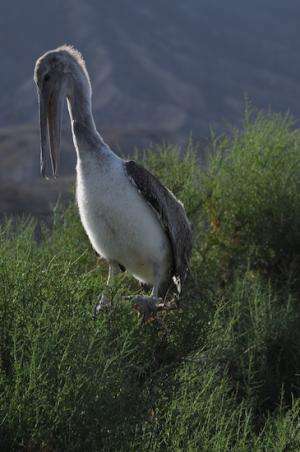 At Angel de la Guarda, there were 120 nesting pairs and zero young in 2014, which is less than 2 percent of the past four years' average since the pelicans were delisted. For comparison, in 2006—considered a "good" year for the pelicans—there were 3,550 nesting pairs and 3,905 young on the island. At Isla San Luis, there were 465 nesting pairs producing 16 young (9 percent of normal) in 2014, compared with 5,400 nesting pairs and 5,940 young in 2006. At Isla Piojo, there were 70 nesting pairs and zero young in 2014 (19 percent of normal), compared with 600 nesting pairs and 660 young in 2006. Low breeding numbers are often associated with El Niño conditions, which bring warmer waters to the Eastern Pacific Ocean. However, this year, the pelicans began showing signs of trouble well ahead of this summer, when El Niño was predicted to begin. Anderson is not sure why this is occurring, though possible explanations include changes to ocean temperature and shifts in the pelicans' food supply. "Populations do decline somewhat during El Niño years, but not nearly as drastically as what we saw widespread this year," Anderson said. "During most El Niño events we've seen, numbers of nesting attempts drop by at least half to two-thirds, and production goes down, too. But it drops from thousands to hundreds, not to 10 or less." This spring, when the birds arrived at breeding colonies at all, many arrived late. 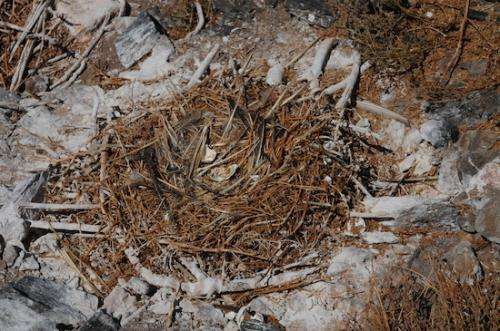 Of those who nested, many abandoned their nests when they could not find enough food to sustain their stay.